"I mean, I don't want to ACT in the movies—I want to LIVE in the movies!" Train Ride to Hollywood is a cinematic oddity, an old-fashioned G-rated musical comedy produced in 1975 and rarely seen due to poor distribution. 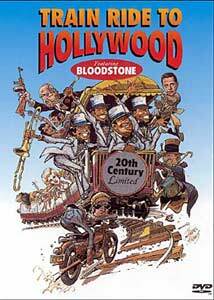 The film stars the rock/R&B group Bloodstone in an extended dream-sequence story about four singing conductors aboard a train filled with beautiful women and impersonated "Old Hollywood" greats including W.C. Fields, Dracula, and Scarlett O'Hara. Musical numbers and gag sequences abound, with the plot (such as it is) driven by the murders perpetrated aboard the moving train by Marlon Brando, who transforms werewolf-style from The Godfather into The Wild One and suffocates Nelson Eddy, Jeanette McDonald, Clark Gable and Jean Harlow in his armpits. Our heroes make it to Hollywood only to be turned into wax sculptures by the evil Brando, waking Harry up from his head-injury-induced dream and returning us to the Bloodstone concert in progress that opens the film. Despite what you may be thinking after reading the above, this movie actually works. I first saw and enjoyed Train Ride to Hollywood in the early 1980's on cable television and hadn't seen it since, so it was with great anticipation and some trepidation that I fired up Anchor Bay's recent DVD release. I'm happy to say that this strange little movie survives, overcoming any critical tendencies I may have developed in the intervening years with its sheer audacity and joy. The film is a respectful but never completely serious homage to Hollywood, with gags influenced by the Marx Brothers and musical numbers in the spirit of the MGM classics. The progressively-less-sane story is a love letter to Hollywood in its heyday, and it's never cynical or mean-spirited. The members of Bloodstone (Willis Draffen Jr., Charles Love, Charles McCormick and Harry Williams) seem to have an instinctive understanding of this material—they throw themselves into its mounting absurdities with energy, humor and professionalism, equal parts Three Stooges and Four Tops. They also contribute several great songs including the show-stopping Train Ride, a wonderfully catchy tune presented with sharp choreography by Hollywood veteran Jack Baker and lavish camerawork under Charles Rondeau's direction. The remaining musical numbers are smaller-scale but still entertaining, including an outrageously upbeat funeral procession, and a surprising number of the cheesy old jokes still work. The celebrity impersonations aren't uniformly great, but they work in the context of the film, with entertaining performances by Jay Robinson as a comic Dracula and Guy Marks as Humphrey Bogart. The film's lighting betrays its low budget, with unnatural shadows and a general "flatness" in most scenes. A few on-screen gaffes turn up, but Rondeau's pacing allows the film to glide over its occasional technical missteps without missing a beat. The film definitely stretches its MPAA "G" rating—there's a hookah-smoking scene (with Dracula exclaiming "That sure is some fine tobacco!" and "Hey, Bogie, don't bogart that joint! "), a herpes joke and rather a lot of cleavage on display, but nothing beyond a contemporary "PG." I can easily imagine this Train running off the tracks in the wrong hands, but everyone involved seems to be having a great time and that sense of fun comes through onscreen. Bold, risky and unapologetic, shot in a scant 15 days in entirely the wrong era, Train Ride to Hollywood is tuneful, gleefully corny and weirdly unique. Image Transfer Review: Train Ride to Hollywood is presented in its original 1.66:1 theatrical aspect ratio, slightly letterboxed within a full-frame non-anamorphic image. The source print has some dirt and emulsion flecking here and there but is otherwise in nice condition with no visible splices, scratches or reel-change markers. The digital transfer's black level is a bit light, dark scenes tend to be murky, and there's a moderate but noticeable amount of grain throughout. The image is otherwise crisp and detailed, the bright colors and cartoonish costumes are well-captured, and this is generally a nice transfer of an older film. Audio Transfer Review: Labeled as a Dolby Digital Stereo release, Train Ride to Hollywood actually features a Dolby 2.0 Surround audio track (apparently re-engineered for this release). Rear speakers are appropriately used for sound effects in a few scenes, though music and dialogue are restricted to the front soundstage. Dialogue and music/atmosphere separation is good, bass is consistently present without being overbearing, and this is a very clean-sounding track for a low-budget film of this vintage. This film depends heavily on its music, and Anchor Bay's transfer does it justice. The original theatrical Trailer is presented with a decent, slightly dark transfer, in 1.66:1 with monophonic sound. It's nostalgic approach is entertaining in its own right and serves to illustrate the difficulty of marketing this film in 1975. This is a very entertaining commentary track, featuring producer George G. Braunstein and the members of Bloodstone, whose off-the-cuff remarks are full of genuine affection for the film and the good time they obviously had making it. Memories of fellow cast and crew members are mixed with information about the production itself, with interesting tidbits about "Old Hollywood" and an unproduced sequel. It's a mono track, making it difficult to tell exactly who's speaking sometimes, and short on technical detail, but it makes for great listening and definitely enhances the film. A series of text screens with photos of the group at various stages in their career, covering Bloodstone's history with a complete discography. Read this before watching the film to appreciate a little "in-joke" during the opening sequence. Train Ride to Hollywood is not for everyone - it's one of those bizarre movies that will elicit confusion and fear among average viewers. But if you're willing to suspend your disbelief, tune into its vibe and go with it, it's great fun, a "buried treasure" with terrific music and a loose, family-friendly sense of humor. Anchor Bay's DVD is nicely put together and may help this odd little musical comedy attain the cult classic status it deserves. Recommended.